Do we need baby boxes? State Senator Patty Birkholz, who died yesterday, was a classy lady who fought for the environment and tried to make this state a better place. She was a proud Republican who nevertheless wasn’t afraid to break from her party on occasion to do the right thing. She was, for example, one of the few prominent Republicans to back the Voters Not Politicians redistricting amendment. But she also did something else very important: Sixteen years ago, she sponsored a bill allowing a mother to safely surrender a baby she doesn’t want or can’t care for at any hospital, police station or fire department within three days after birth. Safely surrender them, that is, without being charged with child abandonment. The law was later amended to allow babies to be surrendered at fire stations, or by simply calling 911. Her “Safe Delivery Act” has resulted in more than 200 babies being safely surrendered since 2001, babies that might otherwise have been abandoned in the woods, or worse. But some feel this still isn’t good enough, that some unhappy mothers may find the experience of having to tell someone they want to give up their child too intimidating. So there are now two bills that would allow a parent to abandon their baby instead, in a box that looks something like a cross between a safe and a microwave oven. 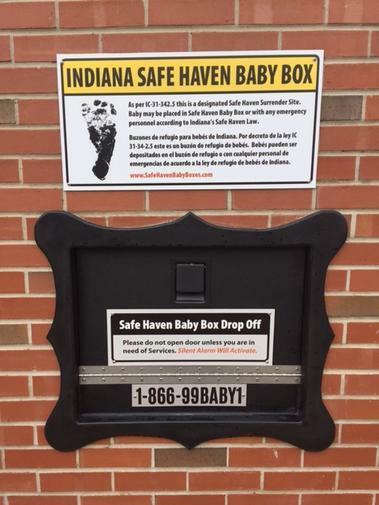 Two “Safe Haven Baby Boxes” are already in use in Indiana, the home state of their inventor, Monica Kelsey, herself adopted as a child. Yesterday, the Michigan House of Representatives Families, Children and Seniors Committee held hearings on these bills, HB 5750 and 5751. The boxes would be attached to the side of buildings like hospitals or fire stations. When someone puts a baby in, a silent alarm sounds inside the facility, and someone is supposed to get the baby within five minutes. When I read about this, I immediately thought of the book return chute on the side of my local library. Then I thought that it was inevitable that prankster kids would put kittens, dolls, et cetera in the baby boxes. A representative from the Michigan Department of Health and Human Services expressed other concerns. There don’t seem to be any construction standards for the boxes, and no human inventions are free from the possibility of malfunction. The department hasn’t taken a position one way or another on this, but their spokesperson also noted that when babies are surrendered to a human being, that’s a chance to collect vital information about the baby’s date of birth and medical condition. Well, I don’t have any position on this either, though I find one aspect incredibly disturbing: Most of the mothers surrendering these babies probably have smart phones that give them access to an entire world of information – but can’t face a conversation with a person. By the way, I’ve noticed that my college students mostly are unwilling and are largely unable to have a coherent phone conversation; they want to communicate almost exclusively by text messages. I had a vision of a world of people texting constantly, never looking you in the eye, and dumping unwanted infants in mechanical boxes. Perhaps we are already there. I don’t know about you, but I find this terribly sad. CORRECTION: An earlier version of this story said baby boxes were also in use in Ohio and Pennsylvania. That is not the case. A law signed by Ohio Governor John Kasich in March allows for a parent to voluntarily deliver an infant to a "newborn safety incubator," but the Ohio Health Department has not created any regulations for these incubators and none exist to date. Abdul El-Sayed and Shri Thanedar are each accomplished men. The 63-year-old Thanedar came over here penniless from India, started companies and made fortunes, even though he also has lost one or two. El-Sayed, who at 33 is barely half Thanedar's age, is one of the smartest and most charismatic people I have ever met.